Mcdonalds has a hot new deal! 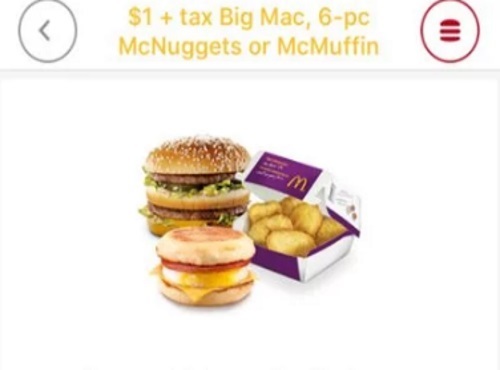 Get a Big Mac, 6-piece McNuggets or McMuffin for only $1 with your My McD's app! This offer is only available to those who login with a new My McD's App account. If you have an existing account, you can create a new one within the app to view the offer. Simply download the app, login with a new account and the offer should appear under the "Your Offers" section. The offers will vary slightly depending on your region, the Big Mac and 6-piece McNuggets are available nationwide, but the McMuffin offer is only available in Atlantic Canada, Ontario and Quebec. Other regions are eligible for any size specialty coffee instead of a McMuffin. This offer is only available until May 19 2017 in Ontario only. So hurry and get it while it lasts!